This eyebrow mascara will enhance your look by filling your lightly coloured or sparse brows with natural colour. 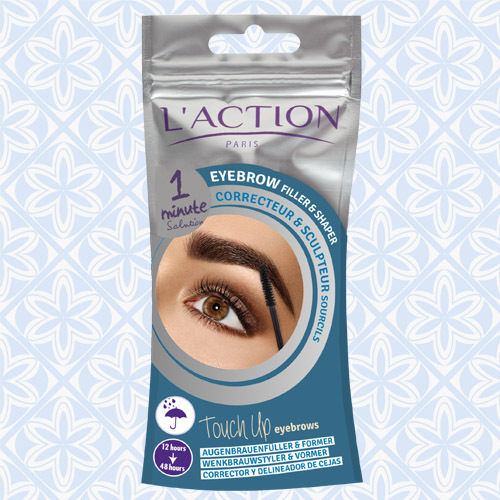 Easy to use, it shapes your eyebrows with a natural finish. Its waterproof formula ensures long-lasting hold. Available in three shades: black-brown, dark brown and medium brown. isododecane, disteardimonium hectorite, dimethicone, sucrose acetate isobutyrate, trimethylsiloxysilicate, propylene glycol myristate, caprylic/capric triglyceride, lecithin. [May contain +/- CI 77891 (titanium dioxide), CI 77499 (iron oxides), CI 77492 (iron oxides), CI 77491 (iron oxides)]. Run the end of the brush along your brows to define their shape. Brush to spread the product and blend in. Avoid contact with eyes. Keep out of reach of children.